For the Banat region territory, the archaeological research concentrated mainly in excavating the necropolises and less their contemporary settlements. Even if they did it, the material recuperated from the settlements is very little known for the chronological span we are analyzing. For example, at Cladova, on the northern bank of the Mureş River, the materials from the settlements are very summarily published, and the same situation is at Ilidia- Obliţa (Ţeicu 2003 a, p. 9-22, Uzum 1989 , p. 39-44 ). As for the Serbian Banat, the situation is better, because parts of the settlements have been published, but the contemporary necropolises are missing ( Trifunović 1989-1990, p. 99-130, see also bibliography, Stanojev 1996 ) . We are aware that, in different places of the Banat region, pottery dated in a certain chronological period was found, but it has been published with drawings either in a small measure, or not at all (Barački, Brmbolić 1997, p. 209-228, Ţeicu 1987, p. 317-345, Uzum 1979, p. 225-254, Ţeicu 2003 f, p. 339-375, Ţeicu, Lazarovici 1996, Luca 2005). Certain pottery groups too (clay cauldrons of Petchenegue type) of the Romanian region of Banat drew the scholars’ attention (Takáks 1986, Takáks 1993, p. 447-482, Lukács 1984, p. 320-330, Diaconu 1956, p. 421-439, Diaconu 1994, p. 155-168). Unfortunately, they studied the objects as such and not in their relationship with the contemporary cemeteries. There is another issue as far as this kind of pottery is concerned, that is its deposit only in funerary complexes, at the northern Danube, in Banat, except for a grave at Sviniţa - 1004 river km, where was found a fragment of a clay cauldron (Boroneanţ 1985, p. 113). The man interventions destroyed the necropolis and the contemporary settlement as well, such as at Moldova Veche-Rât necropolis (Uzum 1979, p. 225-254) and Reşiţa-Ogăşele dungeon (Ţeicu 1996, p. 6). Under the circumstances, analyzing the relationship between the settlements and the necropolises in the geographical area in question supposes some special procedures of study. First of all, we need to define the funerary horizons with the ritual practices and their specific inventory, because there are particular cases, when the typical objects of a necropolis are not necessarily present in the settlement and vice versa (for example, at Ilidia-Funii or Gornea-Căuniţa de Sus). Secondly, we have to localize the contemporary settlements, to inventory the objects recuperated from them, and then, to corroborate the chronological and typical information. The chronology of the objects found in necropolises and settlements is very important for the period under analysis, as they stand for the contemporaneousness of the necropolis and settlement, especially as the objects of the settlement are not necessarily present in the cemeteries. Even following this method of analysis, we found extremely rare and critical dating of the 10 th and first half of the next century settlements. Where necropolises exist, there are not, as a rule, settlements and this situation is due, in particular to the specific of the plain region of Banat, where steppe nomad populations settled, so they had not a fixed place to live in, while in the hill and mountain region, the necropolises of this chronological period have not been researched. That’s why, we are going to discuss only the Bielo Brdo type necropolises, the south-Danubian horizon-2 of the eastern part of the region and those with austere inventory of the Angevine and post-Angevine periods. From the 10 th to the 14 th centuries there are in Banat, several funerary horizons, and every one with its own features ( Oţa 2004, Orizonturi funerare în Banatul istoric (secolele X-XIV), doctor’s degree paper in manuscript, at the library of the Institute of Archaeology „V. Pârvan” in Bucharest. ). We don’t know yet the settlement for the Köttlach (at Deta) type funerary horizon. Besides, the settlements contemporary to the necropolises of the south-Danubian funerary horizon - 1, the graves with austere inventory (1) of the 10 th century, those largely dated (2) in the 10 th-12 th centuries, the steppe horizon-2, the necropolises with austere inventory of the late Arpadian period, the Angevine and post-Angevine ones are either not excavated at all, or the results of the research are not adequately published. Let’s add to all these, the graves without inventory, or those impossible to be assigned (the inventory is missing and the ritual characteristics are not relevant for connecting them with a certain funerary horizon). We are going to analyze the most representative, which are the steppe horizon-1, the Bielo Brdo type horizon, the south - Danubian funerary horizon–2. There are not, for the time being, researched settlements corresponding to the necropolises of the steppe horizons 1 and 2. The situation is pretty similar for the Bielo Brdo type necropolises, where very few settlements are only partially excavated (In Banat, no settlement has been entirely excavated, but only partially, such as at Cladova or Vladimirescu.). As for the 14 th –15 th centuries’ cemeteries, even end of 13 th, the funerary inventory (jewelry and clothing accessories) is almost inexistent. The funerary inventory consists, so far, in coins, rings, exceptionally, earrings (Ilia-Obliţa, one tomb, Cuptoare-Sfogea, Grave 189, Reşiţa - Ogăşele, Grave 15 - could be earlier according to the object typology), plaque necklaces (Cârnecea-Dealul Bisericii- Grave 12), buttons necklaces (Obreja - Sat Bătrân, Grave 15), buttons (Reşiţa-Ogăşele, Grave 24, Caransebeş-Center, Grave 8 from the crypt 5, Cuptoare-Sfogea, Grave 291), buckles (Gornea-Ţârchevişte, Graves 21 and 23), sword (Bucova- Stadion, Grave 1), knife (Gornea-Târchevişte, Grave 39) and pottery (Gornea-Târchevişte, Grave 11, Bucova-Stadion, Grave 1). The situations previously presented are exceptions, in comparison with the discovered necropolises and groups of tombs. The contemporary settlements are also very little researched and published (Ţeicu 1998, p. 263, Fig.101, p. 264, Fig.102, p. 265, Fig.103, p. 266, Fig.104/3-4, p. 267, 268, 270-271, 277, Fig.107, p. 278, Fig.108, p. 279, Fig.109, p. 282, Fig.112, Ţeicu 2003 e, p. 155-169, Ţeicu 1987, p. 326, Fig.8, p. 330, p. 332, Fig.12, p. 340, Fig.17, p. 341, 342, Fig.18, Ţeicu 2003 d, p. 107). The mentioned types of objects are not found, in the present stage of the research, in settlements, excepting, probably, the coins, such as at Cladova. Consequently, the only relevant cases are the necropolises of the south-Danubian horizon-2. We chose, for the study, a number of necropolises from the south-Danubian horizon - 2 (end of 11 th – beginning of 13 th centuries for Banat region, Pl.1), Bielo Brdo (Pl.2) and the necropolises with austere inventory, of Angevine and post - Angevine periods (pl.3). The first type of necropolis, with Byzantine tradition jewelry, continued to exist in Oltenia during the next centuries too, but in Banat, either they stopped their functioning, or there had been some changes in the funerary ritual of the jewelry deposits. In certain settlements, they continued to use the imported ceramics of south-Danubian tradition, but in comparison with the objects deposited in necropolises, the direct parallels are no longer possible, even if there is obvious in some cases, that the two kinds of sites functioned at the same time, such as Berzovia-Pătruieni (Ţeicu 1996, p. 37-47, Ţeicu 1998, p. 112, 123, 263, Fig. 101, p. 130-131, 264, Fig.102, p. 266, Fig.104, p. 178), Ilidia-Obliţa and Sălişte (Ţeicu 1987, p. 327, 330, 332. Fig.12, Ţeicu 1998, p. 265, Fig.103). It is hard to say, in the present state of the research, which was the relation between the necropolises of Ilidia-Cetate and Obliţa on one hand and the settlement of Sălişte, on the other. We chose to study mainly the necropolises of the south-Danubian horizon-2 and their contemporary settlements because both types of sites are excavated, and furthermore, it is almost the only type of cemetery whose kind of inventory is present in the settlements too. The main features of the above-mentioned funerary horizon consist in the presence of Byzantine tradition jewelry (diadems, temple earrings with one or two globular, biconical pendants, different types of beads, similar to those of the Bielo Brdo type funerary horizon, glass bracelets, twisted bronze bracelets, with loops at both ends, rings decorated with anthropomorphic, zoomorphic and fantastic figurines, crosses, pectoral little crosses etc., sometimes together with those of Bielo Brdo type (hairpins with an end S-shaped folded). There is also a series of jewels common to both funerary horizons, such as simple hairpins, simple rings band-shaped, lens-shaped, or circular in section and beads. In both funerary horizons there are Byzantine coins or imitations, Hungarian, or central European coins. Very seldom, we found in settlements, bone plaques from the bow and arrowheads, which could be vestiges of the steppe cultural horizon. There are other features, like the absence of a funerary monument, the sporadic presence of ceramics inside the necropolises territory (Pottery discovered on the territory of the Şopotu Vechi-Mârvilă (Ţeicu 2003 b, p. 31-32) Nicolinţ necropolises (Radu, Ţeicu 2003, p. 212-213). At the grave of Sviniţa-Km. of the river 1004, in the tomb there was a fragment of a clay bucket.) and, very often, the deposit of corpses in the pit having one or the two arms curved from the elbow, while the palms rest on the clavicle or the neck. The Byzantine tradition jewels and the Bielo Brdo type ones have been unveiled in graves and in necropolises as well Ilidia-Funii ( At Ilidia-Funii, in the settlement, was discovered a temple earring with three circular mouldings around the ling, and in the necropolis, hairpins with a S-shaped ending. The settlement and the necropolis have been only partially excavated. In the necropolis of Gornea-Căuniţa de Sus, have been found jewels of Byzantine tradition (earrings with a circular moulding around the link, temple earrings with a biconic frame, finger rings with good analogies in the similar necropolises of the southern river, beads, bracelets made of bronze wires with loops at the endings) and Bielo Brdo type (hairpins with a S-shaped ending, simple hairpins), while in the contemporary settlement, fragments of glass bracelets, enameled pottery of Byzantine tradition (Ţeicu 2003, p. 156), a finger ring, bone little plaques from the bow. At Moldova Veche-Rât, in the settlement, pottery fragments of the same tradition have been discovered (Ţeicu 2003 e, p. 156, 157), and in a tomb, a pectoral little cross. ), Gornea-Căuniţa de Sus. In the settlement of Ilidia-Funii a temple earring with three circular moldings around the link was found, while in the necropolis, hairpins with a S-shaped ending. The settlement and the necropolis have been only partially excavated. In the necropolis of Gornea-Căuniţa de Sus, jewels of Byzantine tradition have been discovered (earrings with a circular molding around the link, temple earrings with biconical frame, finger rings with analogies in the similar necropolises at the South of the river, beads, bronze bracelets with loops at the endings), as well as Bielo Brdo type (hairpins with an S-shaped ending, simple hairpins), while in the contemporary settlement, fragments of glass bracelets, enameled ceramics of Byzantine tradition ( Ţeicu 2003 e, p. 156 ), a finger ring, bone plaques of the bow. In the settlement of Moldova Veche-Rât, were fragments of pottery of the same tradition ( Ţeicu 2003 e, p. 156, 157 ) and in a grave, a pectoral little cross ( Ţeicu, Bozu 1982 , p. 393-395 ). Byzantine and Hungarian coins have been found in both necropolises ( Velter 1997, vol. II, Repertoriul I, p. 7, XLIV/60, Ţeicu, Lazarovici 1996, p. 85, Velter 1997, Repertoriul I, p. 9, Lazarovici, Maxim, Ţeicu, Oprinescu 1993, p. 298, Ţeicu, Lazarovici 1996, p. 85, 86, Fig.51. For grave 49, see Bălănescu 1993, p. 324, but wrongly printed 69 instead of 49. In 1989, they excavated only grave 65, and the grave 49 is the only one excavated and mentioned with a coin, probably Hungarian, in the article written by Lazarovici, Maxim, Ţeicu, Oprinescu in 1993 ). A similar case seems to be the necropolis and settlement of Mehadia-Ulici, but, unfortunately, they were partially excavated and our information is collected from the 18 th century mentions ( Ţeicu 2003 c, p. 95-105 ). Due to the actual situation of the archaeological excavations, there are a small number of cases for study (Vladimirescu, Cladova-Cetate and Biserica din Vale, Ilidia-Funii, Gornea-Căuniţa de Sus, Zomoniţă, Ţ ărmuri, Ţârchevişte, Mehadia-Ulici, Moldova Veche-Rât), but where we could establish a relation between the settlements and the necropolises, based on the objects recuperated. The relative and absolute (based on the coins) chronology of the objects is already established, as well for those of the necropolises ( Oţa 2004, p. 142-259 ), than for the material of the settlements ( Ţeicu 2003 e, p. 155-169, Uzum 1979, p. 225-254, Ţeicu 2003 a, p. 9-22, Ţeicu 1987, p. 317-345, Ţeicu 2003 f, p. 239-275, Trifunović 1989-1990, p. 99-130, Barački, Brmbolić 1997, p. 209-228, Takács 1986, Takács 1993, p. 447-482 ). We are going to mention strictly the objects found in the settlements and necropolises as well. There are very few objects that can establish a connection between the settlements and the necropolises, like: an earring with three circular moldings found in the settlement of Ilidia-Funii (Uzum 1989, p. 41, Fig.6), the glass bracelets of Gornea-Zomoniţă (Ţeicu, Lazarovici 1996, p. 59, 61, Fig.31/1-3), a fragment of a bracelet made of twisted bronze wire, the same settlement (Ţeicu, Lazarovici 1996, p. 59), a circular buckle from the settlement of Berzovia-Pătruieni (Ţeicu 1998, p. 263, Fig.101/7). The first object is analogue to another discovered at Banatska Palanka ( Barački, Brmbolić 1997, p. 211). 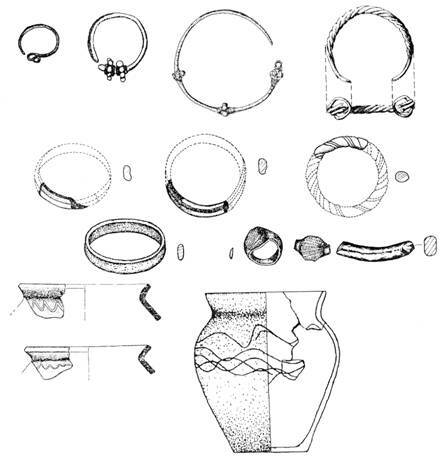 Similar jewelry, at the northern Danube, comes from the necropolises of Cuptoare- Sfogea-seven pieces (Ţeicu 1998, p. 160, Fig. 42/1-2, 4-6, 9), Gornea-Căuniţa de Sus-two pieces (Ţeicu 1998, p. 160, Fig.42/3) and Şopotu Vechi-Mârvilă-three pieces (Graves 27, 33 and 37) (Ţeicu 1998, p. 160, Fig.42/10). The glass bracelets, in fashion especially in the 12 th century at the northern Danube, and probably at the end of the 11 th and the 13 th centuries too, different kinds of fabrication and colour, have typological analogies in the necropolises of Caransebeş-Măhala (Iaroslavschi 1975, p. 361, 363), Cuptoare-Sfogea (Uzum 1987, p. 308, Fig.8/d, p. 309, Fig.9/a-d, p. 310, 311, Ţeicu 1998, p. 169, Fig.51/2, Uzum 1987, p. 308, Fig.8, p. 309, Fig.9, p. 310, 311), Moldova Veche-Malul Dunării (Féher et al. 1962, p. 54; Gohl 1914, p. 17; Sabău 1958, p. 290) and Şopotu Vechi-Mârvilă Grave 17 (Ţeicu 1998, p. 156, Fig.38/12 ). The mentioned necropolises and groups of tombs belong to the south-Danubian funerary horizon-2. The bracelets made of twisted bronze wires (One fragment comes from the settlement of Gornea-Zomoniţă (Ţeicu, Lazarovici 1996, p. 59) are typical to the same South-Danubian horizon-2, with a similar chronology. 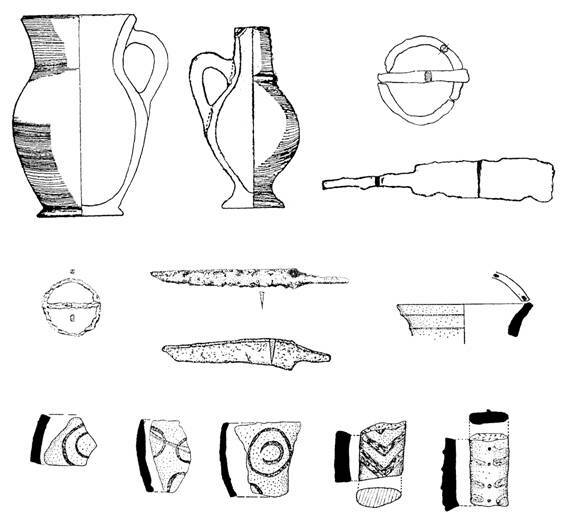 At the North of the river, this kind of objects was found in the necropolises of Cuptoare-Sfogea, Gornea-Căuniţa de Sus and Şopotu Vechi-Mârvilă (Ţeicu 1998, p. 165, Fig.47, p. 166, Fig.48, p. 167, Fig.49). 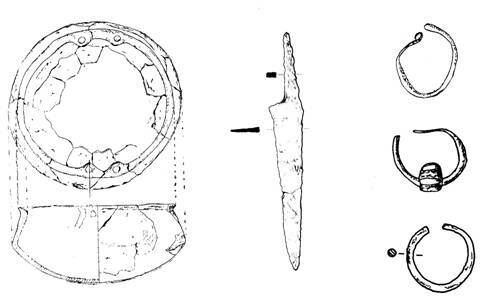 Identical objects to the circular buckles found at Gornea- Târghevişte (Uzum 1975, p.136) and Cladova-Necropola din Vale (Excavations made by V. Boroneanţ, P. Hurezan, P. Hügel, S. Oţa) have been discovered in the settlement of Berzovia-Pătruieni (Ţeicu 1998, p. 263, Fig.101/7). Both necropolises are late cemeteries, with an austere inventory, Angevine and post-Angevine period (14 th-15 th centuries). The settlement dates from the same period. The other types of objects of the settlements have not been found in the necropolises, except for the coins. The presence of the sickles and knives is not relevant in establishing a relation of contemporaneousness between the settlements and the necropolises. In the Banat of the Middle Ages, most part of the objects of a settlement could help to assess the chronological relation between the settlement and the necropolis, relation that is not necessarily of similarity for the common use objects as well as those for the funerary practices. Oţa 2004: Oţa (S.). Orizonturi funerare în Banatul istoric (secolele X-XIV), lucrare de doctorat în manuscris aflată în biblioteca Institutului de Arheologie „V. Pârvan” din Bucureşti.